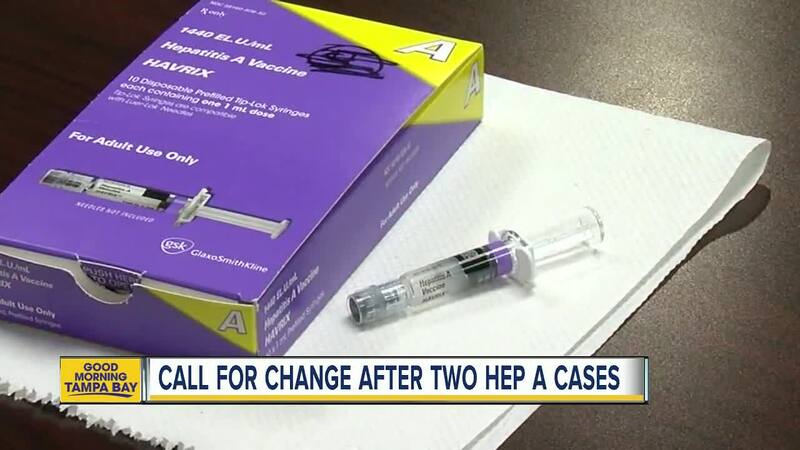 Florida does not require food workers to get tested or be vaccinated for Hepatitis A.
ST. PETE BEACH, Fla. -- Some people in Pinellas County are pushing for change after workers at two popular Tampa Bay restaurants tested positive for the contagious Hepatitis A virus. Florida does not require food workers to get tested or be vaccinated for Hepatitis A. In fact, only a few cities and counties across the country require food workers to get the Hep A shot. Within the past month, workers at Hamburger Mary’s in Ybor City and Toasted Monkey in St. Pete Beach both tested positive for the virus. Both restaurants were forced to temporarily close, according to the Department of Business and Professional Regulations, because inspectors found other issues including cockroaches in the kitchens. One St. Pete doctor, who specializes in Hepatitis cases, says these recent Hepatitis A cases should be a wake-up call for Florida leaders. “Now that we are seeing this outbreak again, we’ve brought it to the surface, and we can get these people vaccinated and prevent these things from happening,” explained Dr. Bob Wallace. In the past, the CDC has not specifically recommended Hepatitis A vaccinations for food service workers because outbreaks are rare and food workers are not at an increased risk of infection because of their jobs. However, symptoms can take up to 15 days after the initial exposure occurs, so sometimes food handlers don't feel ill during the peak time of infectivity. Pinellas County resident William Thompson says Florida should absolutely require Hep A shots and testing for any workers that handle food. Sue Dickinson of Lakeland agrees. ABC Action News contacted the Florida Department of Business and Professional Regulation to see if they’ll make changes requiring vaccines and tests for food workers. We have yet to hear back from them.